Since the Nvidia Shield found so much success as a 4K Android TV-powered set-top box it can be easy to forget the Shield brand started out as a handheld games console. At CES 2017 the Shield TV box received an update in the form of the new 2017 model of the Nvidia Shield, but the portable that started it all was completely absent from both Nvidia’s press conference and the show floor. However, now an FCC filing has revealed that we might be seeing a new portable Shield soon after all. 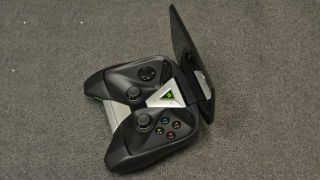 The filing, which was spotted by Reddit user ‘k2kevin’ points towards a device that looks an awful lot like the original Nvidia Shield. However the internals have seen an upgrade. Instead of the Tegra 4 chip that was powering the original handheld, according to the filing the new Shield will contain a Tegra X1 processor, which is the same chip that was found inside the set-top Shield console, and which is rumored to be powering the new Nintendo Switch console in some form. The screen has also seen a resolution and size increase from the original’s 5-inch 720p (1280 x 720) screen to a 5.66-inch 1440 x 810 screen. Wi-Fi should also see an upgrade to the 802.11ac standard, which will be helpful when streaming games from a desktop PC over a home network. We have contacted Nvidia for comment and will update this piece when they respond.